In continuation with concepts of occlusion in prosthodontics part I where concepts developed to achieve balanced articulation were described, now the different concepts developed to attain the non balanced occlusion are described with their merits and demerits. Maxillary posterior teeth should have sharp palatal cusps which should occlude with opposing widened central fossae of the mandibular posterior teeth to eliminate the deflective occlusal contacts in processed dentures and the teeth should have gold occlusal inlays to maintain vertical dimension at occlusion. Accurate retentive denture bases are a requirement in this concept. In centric occlusion, the occlusal contact forces are directed toward the ridges [Figure 1]a. In the right lateral position, the buccal cusps on the working side are out of contact and the occlusal contact forces are directed toward the lingual side of the lower ridge. There is a tendency of shifting of denture bases on the balancing side [Figure 1]b. Accurate retentive denture bases are a requirement in this concept. In centric occlusion, the contact forces are directed toward the ridges [Figure 2]a. In the right lateral position, the canine guidance disocclude the posterior teeth [Figure 2]b.
Masticatory forces are directed toward the ridge bilaterally in centric occlusion [Figure 3]a. In a right lateral position, only the buccal cusps on the working side contact if the path of the condyle is not parallel to the occlusal plane. Tilting of the bases may result if extreme gliding contacts are made [Figure 3]b.
Occlusal contact forces are also reduced in the anterior region of the residual ridges. In centric occlusion, occlusal contact forces are directed toward the ridges. Pivoting in the posterior region of a flat occlusal plane has been used to reduce temporomandibular joint symptoms [Figure 4]a. In right lateral position, only the working side pivot will contact if the path of the condyle on the balancing side is not parallel to the occlusal plane [Figure 4]b. This concept utilizes a posterior tooth blocks in series of four teeth which were arranged on a flat occlusal plane with a reverse lateral curve and posterior ramp. In centric occlusion, the contact forces are directed toward the lingual side of the lower ridge [Figure 5]a. In the right lateral position, the occlusal contact forces directed toward the ridges on the working side [Figure 5]b. In 1927, Gysi introduced the concept of lingualized articulation. In 1941, Payne reported on Farmer's posterior setup that used 30° cusp teeth that were selectively reshaped to fulfill the concept of lingualized articulation and meet the individual requirements of edentulous patients. In effect, the occlusion is lingualized by the elimination of contacts on the buccal cusps and by the anteroposterior arrangement of lower posterior teeth so that their lingual surfaces are on or within the lingual side of a triangle from the mesial area of the lower cuspid to the sides of the retromolar pad. Lingualized occlusion is developed to maintain the food-penetration advantages of the anatomic form while maintaining the mechanical freedom of the nonanatomic form. The lingualized concept utilizes anatomic teeth for the maxillary denture and modified nonanatomic or semi anatomic teeth for the mandibular denture. Anatomic posterior occlusal arrangements have the mandibular buccal cusps occluding in the maxillary central fossae and the maxillary palatal cusps occluding in the mandibular central fossae [Figure 6]a. With lingualized occlusions, only the upper lingual cusps occlude in the mandibular central fossa. The maxillary posterior teeth are rotated slightly to avoid all contact of the buccal cusps [Figure 6]b. 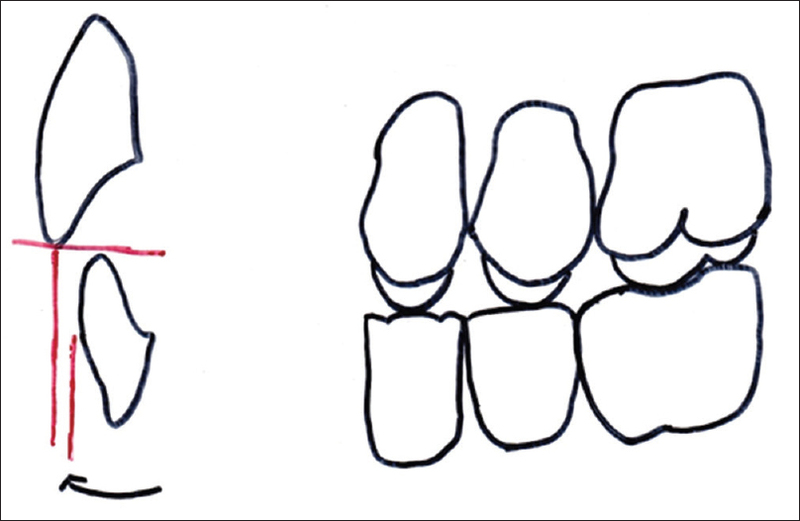 If the horizontal overlap is 3–4 mm between the anterior teeth, balanced occlusion can be achieved before anterior tooth contact at maximum intercuspation. Esthetically vertical overlap of the teeth can be increased [Figure 7]. 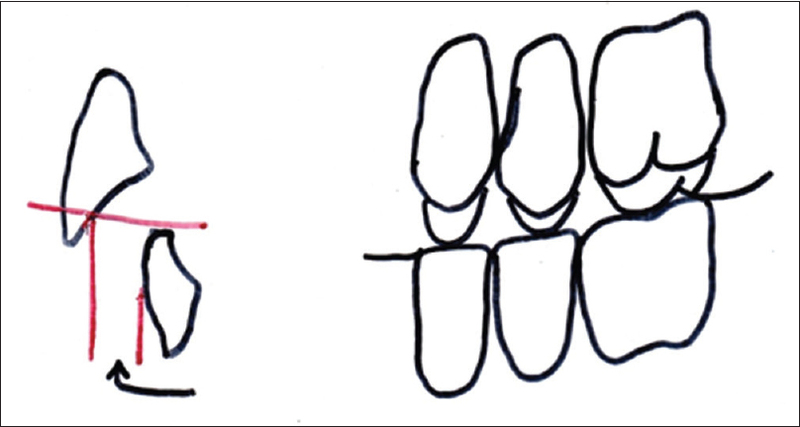 When little horizontal overlap between the anterior teeth is acceptable, then the vertical overlap must be reduced to zero to attain balanced occlusion [Figure 8]. Protrusive movement is possible while maintaining balanced occlusion with a minimal vertical overlap of the anterior teeth [Figure 9]. In left lateral excursive movements, only the maxillary palatal cusps make contact. Selective grinding of the maxillary buccal cusps may be needed to create a clearance between the maxillary and mandibular buccal cusps [Figure 10]. When a complete denture opposes a removable partial denture. The need for bilateral balanced occlusion is based on more favorable stress distribution during parafunctional habits. Nocturnal occlusal parafunction can be eliminated by removal of the dentures while sleeping, but there is still the problem of parafunction during day time. Usually, the desired range of lingualized balanced occlusion can be achieved before the anterior teeth make contact. Anterior tooth position does not compromise the efforts to achieve bilateral balanced occlusion within the suggested range, and the teeth can be arranged to meet esthetic and phonetic requirements. In situ ations where the anterior teeth would contact before achieving the desired range of bilateral balanced occlusion, the vertical overlap of the anterior teeth can be reduced to approach an incisal guidance of zero. In both situations, a slight compensating occlusal curve will be necessary to achieve continuous posterior contacts anterior to centric relation. Vertical forces are centralized on the mandibular teeth. In this concept, the anterior teeth are arranged according to the requirements of esthetics and phonetics. Extreme vertical overlaps producing cuspid guidance are frequently used, resulting in disocclusion of the posterior teeth away from centric occlusion. Characteristic of this concept is the use of pantographic tracings and the transfer of these recordings to an instrument to eliminate all potential deflective contacts in the arrangement of posterior teeth. This occlusion is based on the muscles and joint determines the mandibular position without tooth guidance and that the teeth in the function should always be passive to the parts of the mandibular movements. In lateral mandibular position outside the masticatory movements, the cuspids should prevent contacts on all other teeth. Jones advocated monoplane articulation in 1972. In this concept, a nonanatomic occlusal scheme is used with a few specific modifications. The amount of horizontal overlap is determined by the jaw relationships. The maxillary posterior teeth are arranged first, and the occlusal plane must fulfill certain requirements. Finally, the plane should fall at the junction of the upper and middle thirds of the retromolar pads. Anterior esthetics needs more overjet and no overbite. Balance was considered undesirable, as the resulting inclines would create instability of the dentures. Thus, the teeth are not inclined to form compensatory curves. 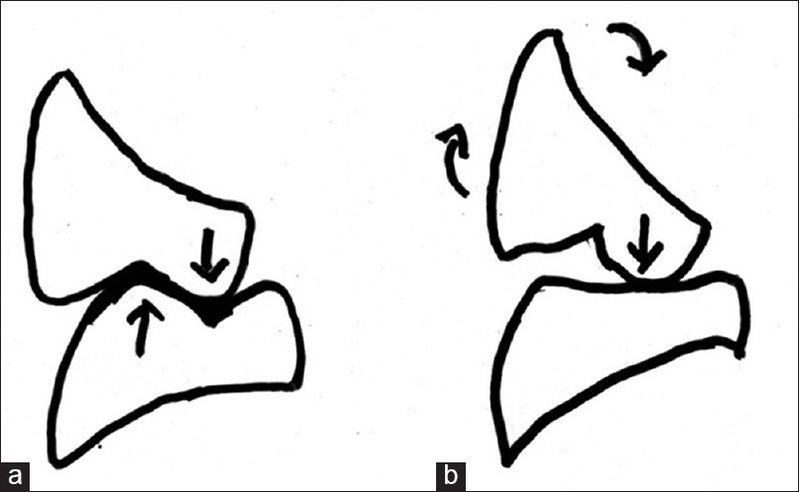 In mediolateral direction, the teeth are set with no medial and lateral inclination. Thus, the concept of occlusion eliminates any anteroposterior or mediolateral inclines of the teeth and directs the forces of occlusion to the posterior teeth. The occlusal plane is parallel to the mean plane of the denture foundation. This concept was carried out by limiting the mesiodistal extent of the occlusal table to avoid arranging the teeth over the lower molar slope inherent in the posterior portion of the residual ridge. To direct the forces toward the center of support and to reduce the functional forces, the buccolingual width of the teeth is reduced and the number of teeth is also reduced to direct the forces in the molar and bicuspid area of support and to refrain from placing a tooth on the ridge incline. If the teeth are arranged in any other manner than described above, excessive pressure or pain is caused due to lateral interferences. Arrange the teeth in central position in reference to the foundation as the tongue will allow, in order to provide greater stability for the denture. He felt this was the most important factor and that “off ridge” contact for the purpose of balance created more problems. De van reduced tooth width to 40% to correct tooth proportion. Reduced width of the artificial teeth reduces the vertical stresses on the ridge. In addition, horizontal stresses were also reduced due to the friction between opposing surfaces was decreased. Forces were centralized without encroachment on the tongue space. Tooth pitch (inclination, tilt) was corrected by placing the occlusal plane parallel to the underlying ridges and midway between them. This positioning directed forces perpendicular to the mean osseous foundation plane. There was no compensating curve and no incisal guidance. Patients were educated not to incise or protrude. Tooth form was modified using flat teeth with no deflecting inclines. This arrangement reduced destructive lateral forces and to direct the masticatory forces perpendicular to the support. All contacts were in a single plane with no projections above or below the plane to interfere with the mandibular movements. The posterior teeth were reduced in number from 8 to 6. This decreased the magnitude of the occlusal force and centralized it to the second premolar and first molar area. Neutrocentric occlusion is especially indicated in class II (retrognathic), class III (Prognathic), and crossbite cases. The flat nature of teeth results in impaired mastication. Mehringer developed physiologically generated occlusion to harmonize complete denture occlusion, neuromuscular system, and the temporomandibular joint. The complete denture fabrication is preceded till try in and processing of only maxillary denture is done. After it is polished, a 20 conical disc is attached to the palatal region of the maxillary denture. The lower denture base is attached with plexiglass followed by fabrication of plaster (1/3 talc and 2/3 plaster) and attaching central bearing device exactly fitting into the upper conical disc. The patient is asked to make chewing and swallowing movements, which created functionally generated paths. Then apply separating medium to obtain maxillary stone cast of generated paths. Lower teeth are arranged according to maxillary cast of generated path. Two-point contacts on working side are eliminated and converted to one-point contact, this increases stability and transmit forces on lingual cusps only. A line of occlusal contacts in one dental arch opposing a flat occlusal table in the other dental arch has the potential of creating the smallest lateral component of force against the denture bases. Since the area of contact is minimal, the frictional resistance is reduced. Furthermore, in the dental arch with the line of occlusal contacts, there is no change in the location of the contact during lateral movements. Therefore, the direction of force in that dental arch remains fairly constant. The decision as to whether to locate the ridge of contacts in the maxillary or mandibular arch depends on the factors of denture stability and esthetics. Exhibits occlusal disharmonies in earlier than occlusion formed with other materials. Advantageous for patients with badly resorbed residual ridges and poor muscle function and who need treatment dentures because of rapid deteriorating or changing ridges. More self-adjusting as mouth changes occur as compared to all porcelain combination. The maxillary denture is esthetically equivalent to normal cuspal contours in the premolar and molar regions. Occlusal plane should be kept as high posteriorly as practical to aid in developing protrusive balancing contacts with a flat plane of occlusion. The occlusal arrangement of artificial teeth, as viewed in the horizontal plane, wherein the masticatory surfaces of the mandibular posterior artificial teeth have a straight, long, narrow occlusal form resembling that of a line, usually articulating with opposing monoplane teeth. Teeth are arranged on a flat plane, which extends from the tip of maxillary central incisors to the top of the retromolar papilla. The 2–3 mm of interocclusal clearance is not needed (centric relation recorded at vertical dimension at rest with 0.020 inch vertical clearance). The anterior vertical overlap is absent to provide noninterception in eccentric movements. The posterior teeth used are nonanatomic with mandibular blade form of teeth. They exhibit bilateral fulcrum of protrusive stability – on protrusion blade form of mandibular second molar contacts maxillary first premolar bilaterally and prevent anterior rotational contact. Woelfel, Mickey, and Allison, in 1962, tested anatomic (33°), modified anatomic (20°), and nonanatomic (0°) teeth to determine the influence of occlusal form on the jaw movements during chewing and the denture movement on its foundation. The shape of the masticatory cycle as shown with cinephotography was not influenced greatly by occlusal form. The closures in all three types of teeth were in close proximity to the posterior border movement. Where the ridges of the subjects were good, the denture base movement was minimal and approximately the same for the three types of teeth, but where the ridge was poor, there was least movement with nonanatomic teeth. Hence, selection of particular concept of occlusion and occlusal scheme in completely edentulous patient depends on maxillary and mandibular jaw relation, residual alveolar ridge resorption, presence or absence of displacive tissues in denture foundation areas, neuromuscular control, patient's mental attitude, and esthetics demands. It is important to explain our patients that treatment with removable complete dentures is not a “definitive” treatment which needs a frequent follow-up to prevent the long-term risks associated with consequences of wearing complete dentures. Complete denture occlusion is a part of the stomatognathic system and not just merely arranging of maxillary and mandibular teeth. The first and foremost concern is about the health and the preservation of the supporting structures. We need to consider all the factors such as biologic, physiologic, and mechanical that favor the stability of the denture base to avoid deflective or excessive forces transmitted to the underlying structures. Beck HO. Occlusion as related to complete removable prosthodontics. J Prosthet Dent 1972;27:246-56. Lang BR. Complete denture occlusion. Dent Clin N Am 2004;48:641-65. Becker CM, Swoope CC, Guckes AD. Lingualized occlusion for removable prosthodontics. J Prosthet Dent 1977;38:601-608. Rahn AO, Heartwell CM. Textbook of complete dentures. 5th ed. Philadelphia: Lea and Febiger; 1993. Brudvik JS, Wormley JH. A method of developing monoplane occlusions. J ProsthetDent 1968;19:573-80. De Van MM. The concept of neutrocentric occlusion as related to denture stability. J Am Dent Assoc 1954;48:165-169. Mehringer JE. Physiologically generated occlusion. J Prosthet Dent 1973;30:373-79. Gronas DG. Lineal occlusion concepts for complete dentures. J Prosthet Dent 1974;32:122-129. Weinberg LA. Temporomandibular joint function and its effect on concepts of occlusion. J Prosthet Dent 1976;35:553-66. Winkler S. Essentials of complete denture prosthodontics. 2nd ed. AITBs Publishers, Delhi: 2000. Koyama M, Inaba S, Yokoyama K. Quest for ideal occlusal patterns in complete dentures. J Prosthet Dent 1976;35:621-23. Woelfel JB, Winter CM, Igarshi T. Five year cephalometric study of mandibular ridge resorption with different posterior occlusal forms. Part I denture construction and initial comparison. J Prosthet Dent 1976;36:602-23.